being in “game shape”. One of the many details of Coach Nick’s job is to cover every detail, and make sure the team is prepared for anything that can happen when they are on the field of play. How do you prepare a team for something that had never been done. 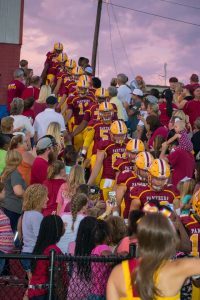 No Abbeville football team in 101 years had two consecutive bye weeks, in the middle of the regular season. Were they going to be focused, prepared, ready, in shape…his worries and the list goes on and on. It took a total of about four minutes to answer his questions. Yes, they were ready. More than ready, they were hungry and it showed on the field and on the scoreboard. Batesburg-Leesville returned the opening kickoff 50 yards and immediately was set up in Abbeville territory. A Cruz Temple interception squashed B-L’s opening drive and ignited an Abbeville team that played with grit, heart and a deep desire to win. 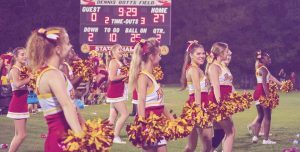 A 14 yard sprint by Courtney Jackson (2-59-1) started the Abbeville scoring onslaught, that didn’t end until Coach Nick called off the dogs in the 3rd quarter. Leading 7-0, three minutes after Jackson’s touchdown run, Dominick Washington (6-76-1) barreled into the endzone to put the Panthers up 14-0. Ja’Bryan Sanders (3-57-2) scored three minutes later, and JD Moore (7-97-1)out sprinted the B-L defense for a 60 yard TD run to make the score 27-0. Moore found Quad Woods for a 20 yard TD pass on their next possession for his 7th TD toss of the year. The scoring continued as Robin Crawford (6-29-1) found paydirt to put the Panthers up 41-0 with 2 minutes left before halftime. Ja’Bryan Sanders out raced the B-L defense for a 27 yard score in the third quarter and the Panthers led 48-7. The Panther defense got in on the scoring fun when B-L running back Tayvon Wilson was stripped of the ball, and Nate Temple scooped and scored from 31 yards out. 55-7 was the final score, and honestly, it wasn’t that close. The Panthers averaged 9.9 yards per play. They rushed for 365 yards and controlled the game from the opening whistle. The Panther defense was suffocating again. B-L faced eleven third downs on Friday night and they only converted twice. For the season, the Panthers are holding their opponents to a 15.5% third down success rate. That’s salty, gritty and just plain nasty.